The 2009 case that became known as the "Jersey Sting" (including an episode of the CNBC show American Greed) was known by the FBI code name "Bid Rig." It involved a group of rabbis who arranged for kidney donors in Israel to be paid for their organs, which were then imported and transplanted in the U.S. (which is illegal). The kidney transplant scheme involved bribing numerous politicians, and also involved numerous rabbis laundering the money; 44 people were arrested in the big resulting FBI sweep. The key FBI informant was Solomon Dwek, known as "C.W. ", for Cooperating Witness, who was accused of money laundering and hence cooperated with the FBI to entrap the others. Chris Christie was the U.S. Attorney during the preliminary investigation (but by the time of the arrests, he was already running for Governor). The Jersey Sting case showed that corruption was endemic in New Jersey politics; but that was well-established prior to this case. Christie certainly gets credit for pushing through a major political corruption investigation which led to major arrests. But some accuse Christie of focusing on Democratic politicians (p. 324). From reading this book, it seems that Christie was just doing his job, regardless of the party affiliations of those involved. So how does this relate to "BridgeGate"? (That's the 2013-2014 scandal in which the George Washington Bridge access lanes in Fort Lee, New Jersey, were closed as political retribution against Christi's political enemies, but in which Christie was never proven to have been directly involved). At issue is that Christie (or Christie's administration, under his explicit or tacit guidance) behaved as a "bully" against the mayor of Fort Lee, and in general bullied other politicians around too. 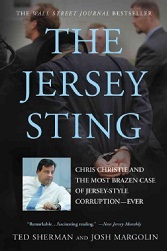 In this book, that does seem to be part of Christie's character, although it's hard to separate out which part is "character" and which part is that Christie's job, as U.S. Attorney prosecuting major criminals and corrupt politicians, had "bullying" as an inherent part of the job. Either way, Christie did enter the governorship with the mindset that bullying was the way to get things done, and BridgeGate certainly exemplified that he inculcated that same mindset in his staff. We at OnTheIssues do not believe that BridgeGate will harm Christie's chances in 2016. We believe that Christie is one of the frontrunners for the 2016 nomination at this early stage, and that he will remain so. Christie is a centrist who is reasonably acceptable to just about every major faction within the Republican Party, and acceptable to many Democrats and independents also. If you're interested in understanding how Christie behaved as U.S. Attorney, this book does a good job describing it. And if you like "true crime" books, you'll just LOVE this book, especially if you like politics too. Donald Trump: 2002: Participated in development boom of Jersey City. Al Gore: Introduced legislation banning human organ sales. Chris Christie: 2002: Aggressive political campaign for US Attorney position. Chris Christie: Prosecuted international scheme for human organ sales. Chris Christie: OpEd: Loved decrying officials trading on elected office. John Ashcroft: 2007: Earned $52M monitoring medical device kickbacks. Orrin Hatch: Introduced legislation banning human organ sales. Chris Christie: Corruption is key because people need faith in government. Chris Christie: Legacy as U.S. Attorney: dismantled N.J. Democratic Party. Albio Sires: 2002: Avoided prosecution when chief fundraiser convicted. Barbara Buono: 2009: Initially selected as Jon Corzine's running mate. Chris Christie: His idol: Bruce Springsteen; favorite song: Thunder Road. Chris Christie: OpEd: U.S. Attorney office often leads to statewide posts. Chris Christie: 2006: Questioned for subpoenas timing to affect elections. Jon Corzine: 2004: Suspicious payments of $10,000 a month. Jon Corzine: OpEd: "tone-deaf" when trying to connect with voters. Richard Codey: OpEd: Saved N.J. Democratic party after McGreevey affair. Robert Menendez: Child of Cuban emigrants. Robert Menendez: 2006: Investigated for grants to community service agency. Samuel Alito: Former New Jersey U.S. Attorney (1987-1990). by Ted Sherman & Josh Margolin.